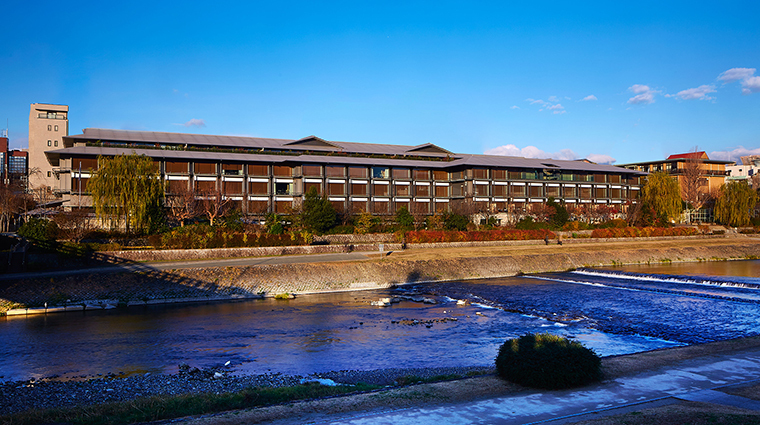 Despite its array of beautiful, charming ryokans (Japanese-style inns), Kyoto lacked a true full-service luxury hotel until The Ritz-Carlton, Kyoto showed up in 2014. 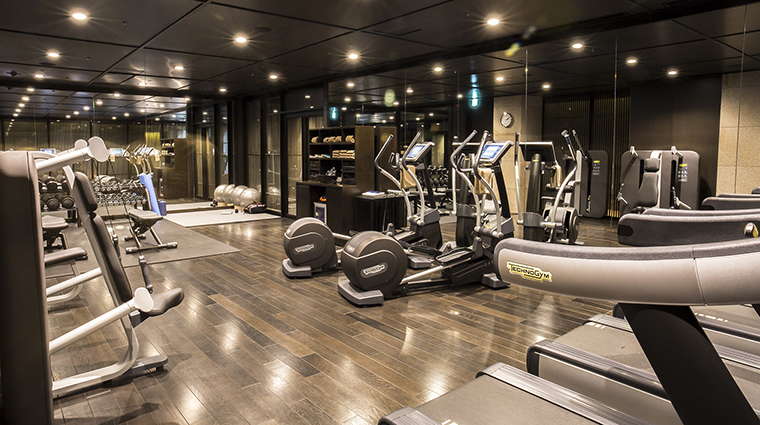 Upon arrival, it instantly became the most detail-oriented, high-end property in the city, combing everything you’d expect from Ritz-Carlton service with a great location along the Kamogawa River, where you have wide city views and are within walking distance of multiple subway stations for immediate access to the city’s famed temples and gardens. 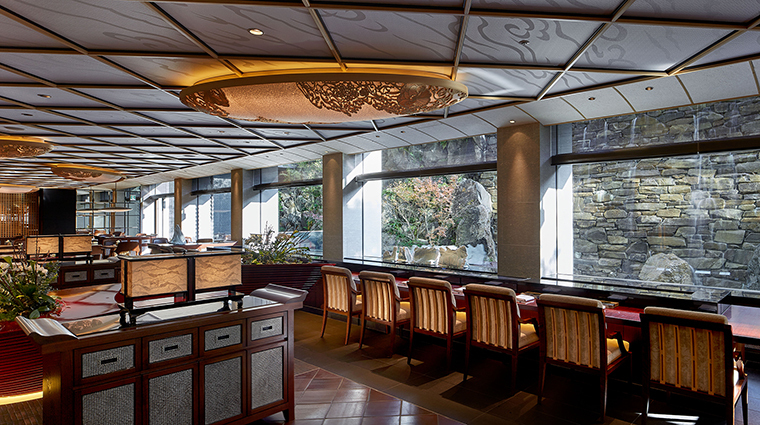 The exterior design draws its inspiration from five Japanese words and feelings: utage (“festive”), seido (“serenity and movement”), miyabi (“elegance”), hana (“splendid”) and nagomi (harmony). 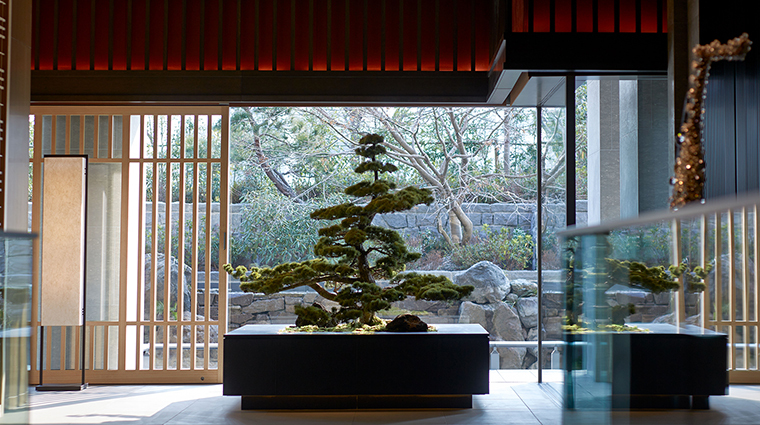 The interior common area, which peacefully features a three-story waterfall and a variety of gardens, is highlighted by an art theme modeled after the classic 11th-century novel, The Tale of Genji. 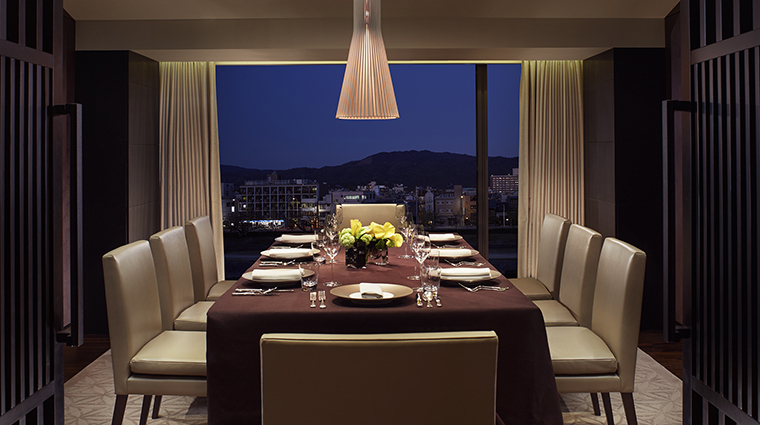 The 17 high-level suites are the most stunning. 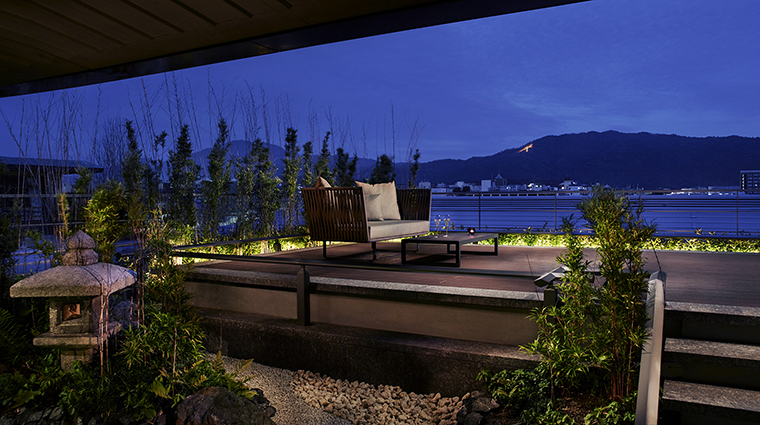 Most have Zen gardens, terraces and the best views the hotel has to offer. 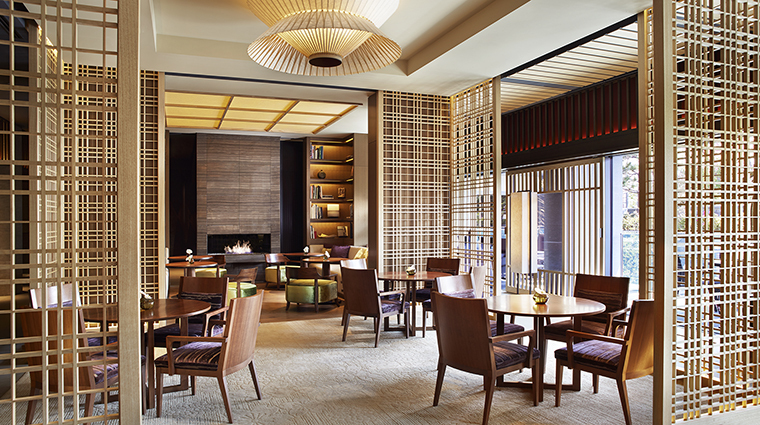 The Kyoto hotel plays both sides of the coin when it comes to food, putting its best foot forward with its Japanese offerings but rounding it out with Western fare and flair. 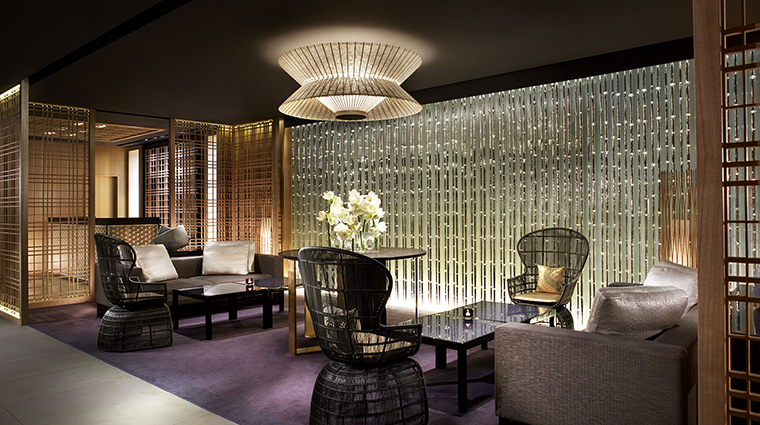 The spa at the luxury hotel focuses on the concept of running water. 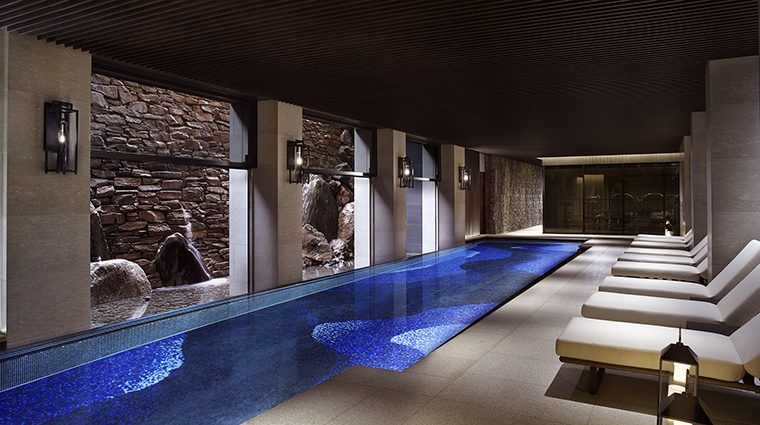 In fact, the three-story waterfall that you see on the main level runs all the way down into the 65.6-foot swimming pool at the spa, serving as the backbone of the entire property. Eighty artists created more than 400 works that interpret The Tale of Genji, specifically the residence of the its main character, Genji Hikaru. 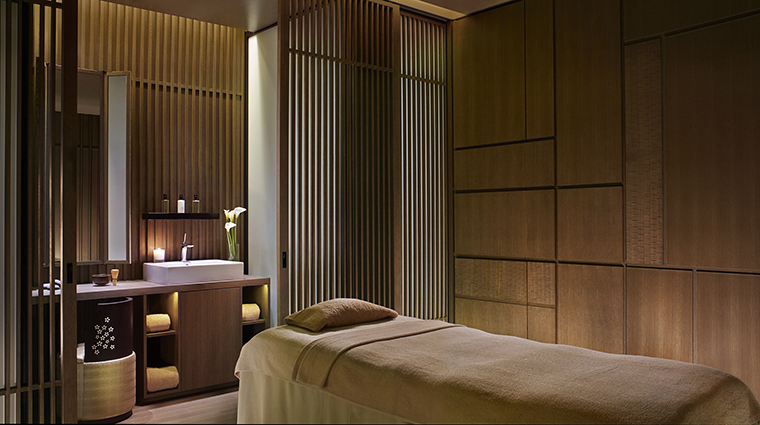 The spa has seven treatments rooms in total, including one spa suite, and features products from international brand ESPA. 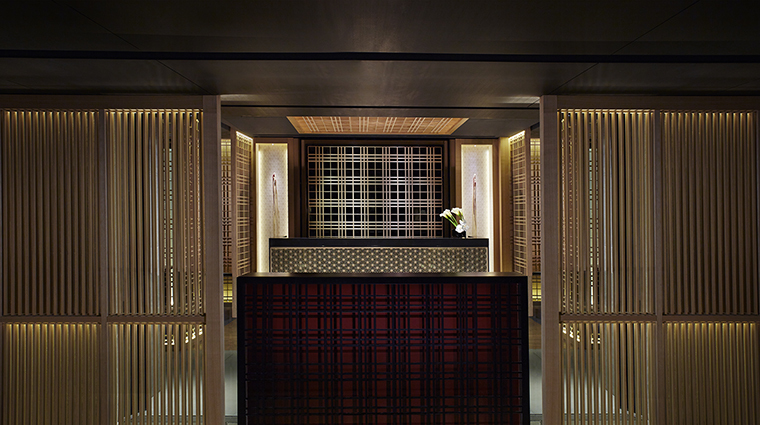 The Ryokucha Serenity Ritual comes highly recommended for its “when in Rome” element of incorporating local green tea leaves into a gentle, flowing massage. 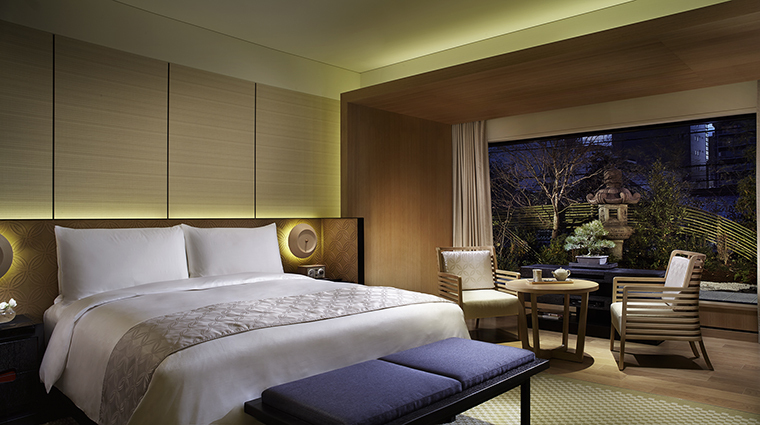 Rooms are airy and bathed in neutrals — expect light wood furnishings, picture windows, bonsai plants and a sleek Japanese aesthetic. 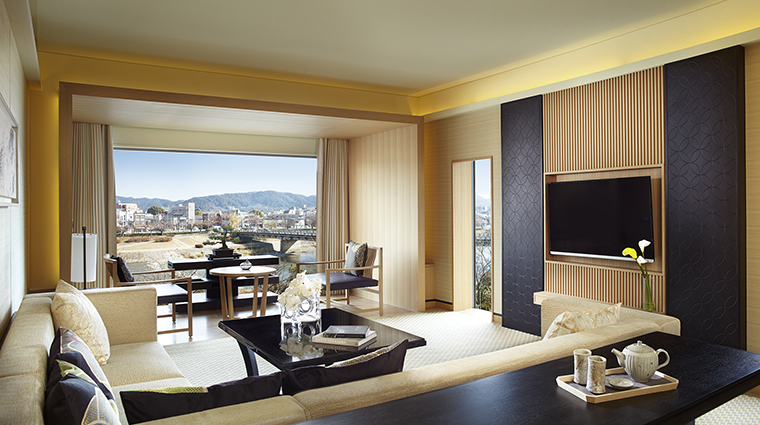 The Ritz-Carlton, Kyoto has 134 guest rooms in total, the majority of which are Deluxe, Deluxe Garden, and Luxury Rooms. 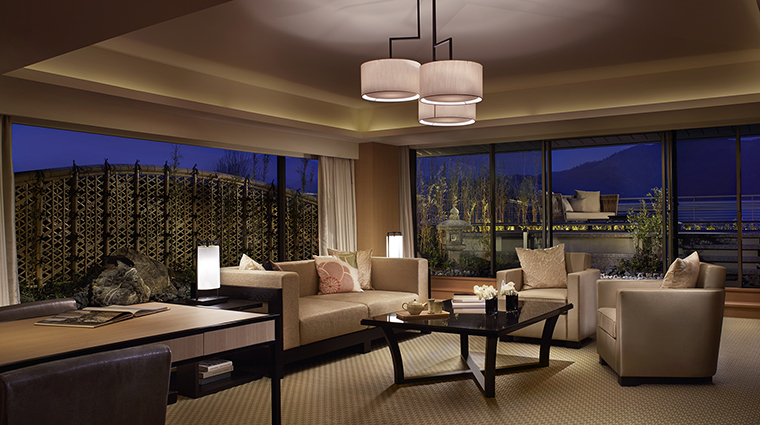 The major difference between them is not in size or décor but in extras: The Deluxe Garden rooms have garden views, and the Luxury Rooms come with floor-to-ceiling windows and river or mountain views. Bathrooms have a distinct cherry blossom motif and are stocked with Asprey products and local handmade soap and bath salts. 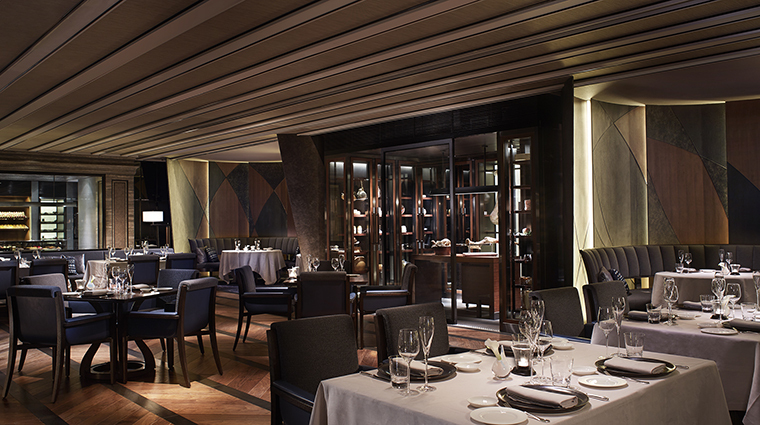 If you crave Western bites, go for Italian at La Locanda or a French pastry at Pierre Hermé Paris Boutique. 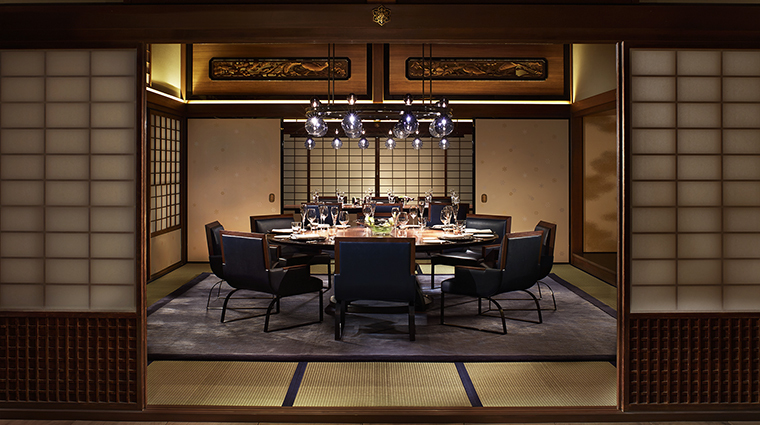 Yet it is the hotel’s Mizuki Japanese restaurant that has a gained strong reputation throughout the city for its multi-course kaiseki feast, a must-do for first-time visitors to Japan. The kaiseki style is composed of small, meticulously plated dishes that follow the Japanese tradition of go-mi, go-syoku, go-ho (five flavors, five colors, five cooking methods), artfully balancing taste, texture, presentation and color. 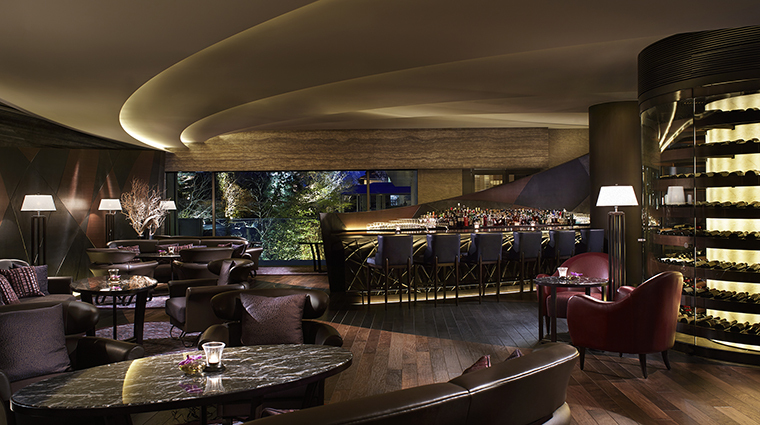 No matter where you eat, hit The Bar afterward for its 360-degree cellar and more than 400 wine selections.